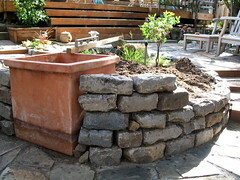 You can see from this picture that I’m going to try to keep the top course of stones level with this planter. There’s an 8 ft. post with a level on it resting on the planter and on a temporarily placed stone at the far end. The manzanita and native grasses now of consuming interest to the Kitty (look closely, you’ll see) will go in this planter. I have some stones dry-stacked to the level of the new wall. I have to figure out how to use mortar to do this project. Something I have not done as of yet.